Cayenne pepper is an aromatic spice derived from the Capsicum annuum pepper. 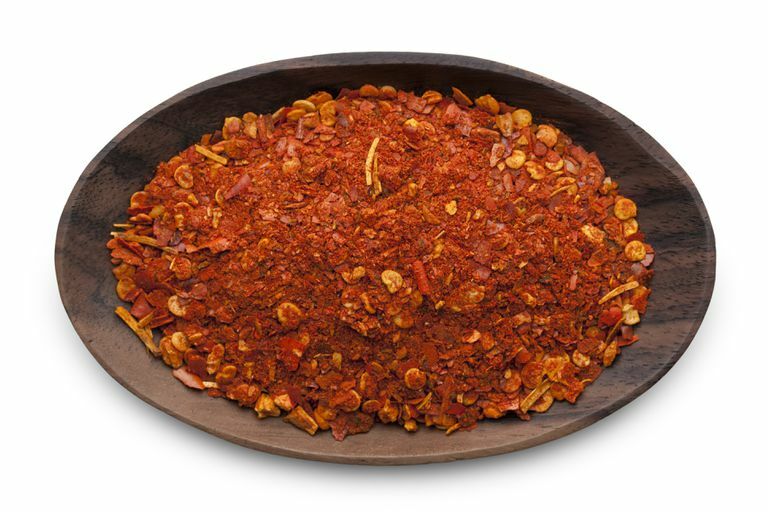 The spice is created by seeding, drying, and grinding the fresh red-colored peppers. It moderately hot (30,000 to 50,000 Scoville units) and commonly used to make spicy foods. Cayenne is also sometimes used to treat muscle and joint pain. Cayenne contains a substance known as capsaicin that gives the spice its "heat" and creates a burning sensation on any tissue it comes into contact with. When delivered at correct concentration, capsaicin has a therapeutic effect, triggering a biochemical reaction that is both analgesic (pain-relieving) and anti-inflammatory. When used for pain, capsaicin is most often found in topical ointments or infused in transdermal patches. Cayenne pepper is also sometimes used under the presumption that it can improve your cardiovascular health, lower blood pressure, or promote weight loss. While some of these claims are better supported in research in others. scientists have begun to acknowledge that the benefits of cayenne—and specifically capsaicin—may be far more extensive than previously believed. Most of the research regarding the benefits of cayenne are limited. And it is not necessarily because the claims are far-reaching or excessive. As a natural supplement, cayenne does not have to undergo the rigorous testing that pharmaceutical drugs do. As such, there are gaps in research that aren't pursued, mainly because the cost of research doesn't financially warrant it. The same doesn't entirely apply to capsaicin. Because of its use in some pharmaceutical-grade products, the U.S. Food and Drug Administration (FDA) issued guidance in October 2018 recommending that products containing 8% capsaicin undergo double-blind bioequivalence studies to ascertain how well a product works compared to standard pain-relief medications. The FDA guidance is not mandatory but one that manufacturers are increasingly following to gain the FDA stamp of approval. Capsaicin is a neurotoxin. It works by reducing the concentration of substance P, a compound produced by the body which delivers pain signals to the brain. By reducing the concentration of substance P around a local injury, your brain won't perceive the pain quite so profoundly. A 2006 review of studies published in the Cochrane Database of Systematic Reviews concluded that there was "moderate evidence" that cayenne-based topical therapies were more effective than placebo in relieving low back pain. A more recent study published in the British Journal of Anaesthesia similarly concluded that topical capsaicin cream provided modest relief of chronic muscle and joint pain when applied three to five times daily for 2 to 6 weeks. In recent years, as topical creams (like 0.1% Capzacin-HP) have given way to higher-dose therapies, the research into the effectiveness of capsaicin has expanded, providing evidence of its benefit in providing mild pain relief for osteoarthritis, rheumatoid arthritis, sports injuries, and repetitive stress injuries. In addition to its analgesic effects, capsaicin exerts mild anti-inflammatory effects, causing the dilation of local blood vessels which some believe can aid in the healing of a joint or muscle injury. Neuropathic pain is the term used to describe the pain caused by the damage to nerves. Capcaisin has long been explored as a means of treating neuropathic pain given the lack of effective pharmaceutical remedies. Some of the earliest research involved the use of high-dose capsaicin patches to treat drug-induced peripheral neuropathy in people with HIV. Many of the earlier HIV drugs caused the demyelination of nerves cells (essentially the stripping out the outer insulating layer). A 2009 study published in Therapeutic Drug Monitoring concluded that a high-dose capsaicin patch used for 60 minutes on 173 people with HIV drug-induced peripheral neuropathy resulted in a twofold decrease in pain compared to those using a placebo. Based on this and other findings (including the use of high-dose capsaicin to treat sciatica, diabetic neuropathy, and fibromyalgia), the FDA approved the first 8% capsaicin transdermal patch, called Qutenza, specifically for the treatment of post-herpetic neuralgia (a type of long-lasting nerve pain following a bout of shingles). Despite evidence in support of high-dose capsaicin in treating moderate to severe neuropathic pain, there is little evidence that a topical cayenne ointment or salve will provide similar relief. The evidence supporting the use of cayenne tablets in boosting metabolism and losing weight is generally weak. It has long been asserted that cayenne has thermogenic properties that can speed up your metabolism and burn more calories when included as a part of a meal. While a cayenne tablet can certainly induce sweat, a sign of increased metabolism, there is no evidence that this effect correlates to increased fat burning or weight loss. With that said, a 2015 review of studies published in BMJ Open Heart suggested that the biochemical reaction triggered by capsaicin may have practical applications in treating an array of metabolic and cardiovascular disorders. The evidence mainly involved research into the use of dietary cayenne in rats, pigs, and other mammals. Among the cited benefits, capsaicin was shown to stimulate endothelial nitric oxide synthase (eNOS), a substance that helps reduce blood pressure and slows vascular damage associated with atherosclerosis. Capsaicin may also increase the production of uncoupling protein 2 (UCP2) in the liver, heart, and blood vessels, slowing the abnormal enlargement, scarring, or thickening or these vital organs. What this suggests, in a far-reaching way, is that a diet rich in cayenne may be beneficial when used to prevent or treat atherosclerosis, diabetes, non-alcoholic fatty liver, hypertension, and stroke. Even so, the researchers admit that the practical application of this remains weak and that the doses used in animal studies would be non-viable in humans. When applied topically as a cream or transdermal patch, low-dose capsaicin is considered safe for adults. Even so, side effects are common, including irritation, burning, and itching. The stronger 8% Qutenza patch may cause localized swelling, rash, pain, and even blisters, particularly in people with sensitive skin. Cayenne tablets may cause stomach upset, sweating, flushing, diarrhea, and runny nose. It is not advised for long-term use. In rare cases, the overuse of cayenne tablets may cause liver and kidney damage. Topical capsaicin should never be used in children unless under the direction of a doctor. As a general rule, cayenne tablets should not be given to children. There is no medically prescribed dose of cayenne supplement, most manufacturers will recommend between 30 milligrams (mg) and 120 mg three times daily for general health purpose. Over-the-counter ointments and patches are available in strengths of between 0.025% and 0.1%. Topical creams are used as needed but, depending on the strength, should not be applied more than four times daily. Transdermal patches, like the Salponas Gel Patch, can generally be applied every four to six hours for pain relief. The Qutenza 8% patch, used specifically for severe neuropathic pain, is only worn for 60 minutes, no more, every three months. There are numerous over-the-counter ointments, gels, extracts, patches, and pills that contain cayenne or capsaicin. Some are marketed using the term "capsicum" rather than cayenne or capsaicin. There are even cayenne pepper teas and decongestant nasal sprays used for natural therapies. Many of these products can be purchased online or found at local drugstores or health food stores. Qutenza transdermal patches are available only by prescription. As effective as capsaicin-based agents may be in relieving pain, never make a homemade topical cream with storebought cayenne. Unlike capsaicin, which is manufactured to an exact concentration in the lab, cayenne strengths can vary by brand, storage, and age of the spice. Never apply cayenne directly to the skin, and avoid touching your eyes after handling the spice. Anand, P. and Bley, K. Topical capsaicin for pain management: therapeutic potential and mechanisms of action of the new high-concentration capsaicin 8% patch. Br J Anaesth. 2011 Oct;107(4);490-502. DOI: 10.1093/bja/aer260. Babbar, S.; Marier, J.; Mouksassi, M. et al. Pharmacokinetic analysis of capsaicin after topical administration of a high-concentration capsaicin patch to patients with peripheral neuropathic pain. Ther Drug Monit. 2009 Aug;31(4):502-10. DOI: 10.1097/FTD.0b013e3181a8b200. Gagnier, J.; van Tulder, M.; Berman, B. et al. Herbal medicine for low back pain. Cochrane Data Syst Rev. 2006 Apr 19;(2): CD004504. DOI: 10.1002/14651858.CD004504.pub3. U.S. Food and Drug Administration. Draft Guidance on Capsaicin. Silver Spring, Maryland; issued October 2018.